If you're a gardener or plant hoarder, then it's almost inevitable that you've purchased plant products that made you ask the question, "Can I recycle this?" Even though the act of gardening—both indoors and outdoors—is by nature a healthy, green and life-affirming activity, it doesn't mean that it comes without baggage. And by "baggage"—I mean non-recoverable materials (a.k.a. waste). For one, I see the amount of waste that plant shops generate through their wholesale orders. Sure they recycle the cardboard and compost the dead leaves, but there are plenty of other packing materials that end up going into the waste stream—just to get the plant to the shop and eventually into your home. Though wholesale waste is definitely worth mentioning and something to seriously consider, I won't be covering it in this post. Instead, I'm most interested in sharing my knowledge as to what you can do with the materials that often come along with your newly purchased plant. Buying plants often comes with products, like plant pots, plant tags, and plastic bags. Luckily for us, most of this can be recycled. Plant pots are typically made from a slightly rigid, yet flexible plastic #5. You'll often see it written as "PP #5", which stands for polypropylene. Other common plant pot plastics are polyethylene #2 and polystyrene #6. New York City began recycling rigid plastics, including #5 and #6, as of April 2013 under the Bloomberg administration. Depending on where you live, your city might not yet accept them, but that's changing. "They're actually very valuable," my friend Ron Gonen, co-founder of Closed Loop Fund shared with me (he and his team were also responsible for implementing the program under his past role as Bloomberg's Deputy Commissioner of Sanitation, Recycling and Sustainability for New York City). "It's a scale issue. We need more of [those materials] recycled in order to build robust markets." 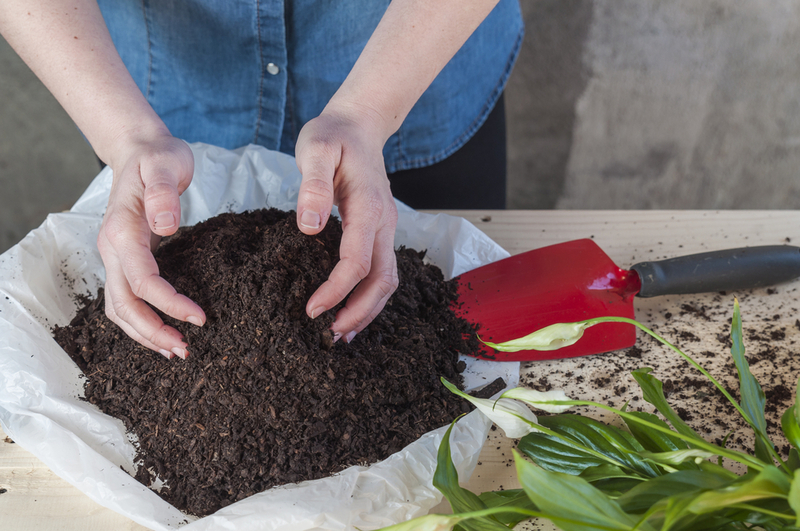 When you recycle your plant pots, just make sure you clean out the excess dirt. Depending on the recycling facility, dirt left in the containers can contaminate the other recyclables and devalue them. And once your pots are recycled, they're upcycled into many different products. In the case of #5, it can be upcycled into car battery cases, bins, pallets, signal lights, bicycle racks and more. If you live in an area that doesn't yet accept the plastics your plant pots are made of, then you can wash the planter pots out with a mild soap solution and likely return them for use at a local greenhouse or nursery—or ask your local plant shop or garden center whether they can return them for you upon their next greenhouse delivery. I always find it to be a useful practice to write or tweet companies to let them know how you personally feel about their practices, including commending them on what you believe they're doing right. A little while ago, I had written to Espoma, the iconic soil company that's been around since 1929 to inquire about recycling options for their bags. @espoma are your plastic bags recyclable in any way? Can they be if not? If not, what ways can you reuse them to minimize waste? I recently sent a query on Twitter, but figured it's best if I had more than 140 characters to write my query. I wanted to inquire about the reuse of your bags. I live in NYC and am a constant gardener, which means, I go through a lot of soil. I'd like to minimize—if not eliminate my waste from gardening, however, and find that most of my waste comes from soil bags. Is there any way to recycle your plastic bags? Or do you have a take back program? Some clever reuse of your bags so they don't have to go to landfill? NYC currently demands that stores recycle film plastic—from grocery bags to bread bags—but this does not include soil and mulch bags, unfortunately, which are often too...ahem...dirty...to recycle. Multi-material depots, which can be found here in New York and in places like Canada do recycle soil and mulch bags. That can be a little inconvenient for people, of course, so the best thing that one can do is WRITE THE COMPANY. Seriously, write the company (like I did above), and begin asking them 1.) how to recycle their bags 2.) if they have a take back program, and if not 3.) if they could consider switching over to compostable bags. Cities like New York are moving toward some real state-of-the-art composting facilities, so if these companies hear from enough engaged citizens—or if we convene enough around changing policies (perhaps via organizations like NRDC or League of Conservation Voters) in our home states—then we can make reducing waste far easier. The plastic identification tags in plant pots are recyclable in most recycling centers. Sometimes they are quite small, so they should be placed in plastic bags. Additionally, you can leave them with or return them to the garden center or greenhouse, as they'll most often reuse them. Many plants come with plastic identification tags, which may have species name and care instructions. These are all recyclable. However, due to how small they are, they should be placed together in a recyclable bag or container. You can also wash them off with a mild soap solution and see if your local greenhouses will want to take them back; I'm sure they would be happy to since printing them costs money—and taking them back will help them save money. Think of anything else that often comes with a plant and wonder if it's recyclable? Or have any other good upcycling ideas? Just right them below in the comments.